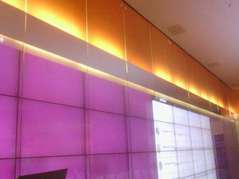 The Twitter Wall: A Fight you can't win? Quite a few conferences are using Twitter walls these days, i.e. 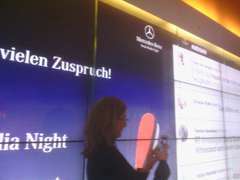 a screen that shows tweets related to the event in real time. They help attendees see what's going on, in the talks but also around the event as such. Twitter walls that are visible to the audience during a talk are a real challenge for the speaker, though. It means that any comments that are being tweeted are immediately visible to all the other attendees. So that remark which - in the times before Twitter - you would quietly make to the person next to you suddenly gets a much broader audience. This applies to praise as well as to criticism. Even more so to criticism, actually. As a presenter, this puts you under additional pressure and also into an awkward position, especially if you can't see the Twitter wall from where you are standing. The audience may suddenly laugh and you have no idea whether it was something you said or did or if it was in reaction to a tweet. Things can also escalate quickly, as I witnessed during a recent talk. The audience was initially just lightly mocking the speaker's marketing speak, but as the presentation went on - and it turned out not to be very good - they started picking up every little mistake and problem. The poor speaker realised something was going on, but since she was already struggling with her presentation, it didn't exactly help. Side note: I don't think it had anything to do with the fact that it was a female speaker. The comments were all about the content and the actual presentation; that particular audience would have mocked a male speaker just the same under the same circumstances. As a speaker, is there anything you can do? Probably not much, especially if you're not a quick repartee. Event organisers setting up a Twitter wall should warn their speakers in advance, though, and also make sure the speaker can actually read the comments easily, so they can at least see what's going on. A second screen for the speaker may help. The good thing about tweets is that they're short, so you can make an attempt and quickly read a few when you have a moment between two slides. You will have to assess the audience's reaction to your talk constantly anyway and the Twitter wall is just an additional feedback channel. In fact, it's a more verbose form of feedback, so it can actually make it easier for you to see if your audience can follow you or if they have a problem with anything that you were saying. To avoid things getting out of hand (as in the above situation), it's probably a good idea to keep an eye on the Twitter stream at the beginning of the talk, so that you can react to possible criticism early on; whether by clarifying things or by adjusting the way you present, depending on what is being pointed out to you. Your audience will appreciate it when they see you react to what they're saying. On the one hand, that will help keep the comments from escalating. On the other hand, it could result in more questions being asked that way, at which point you should point out to the audience that they can still ask questions in the conventional way, i.e. by speaking out. To be able to react to comments or questions (in person or via Twitter), you have to make sure that you have your presentation down pat, so they don't throw you off course. Try to stay calm and keep up with the comments. Reply to questions or opposing views like you would if they had been brought up in the old-fashioned way. In a nutshell: Try to defuse the Twitter bomb early on by reacting to questions and comments calmly, just like you would in reaction to normal questions from your audience. (Photos by yours truly, taken at different occasions in the same venue. "The Twitter Wall: A Fight you can't win?" by Dirk Haun is licensed under a Creative Commons Attribution-ShareAlike 4.0 International Licence.